Mike Ullery|Call Photo Piqua High School senior Kelsey Bachman signed her letter of intent to play golf for Otterbein University recently. Shown with Bachman are her parent Anita (left) and Kirk (right) Bachman. Piqua High School senior Kelsey Bachman has been a quick study in the game of golf since her love affair with the game began as a freshman. 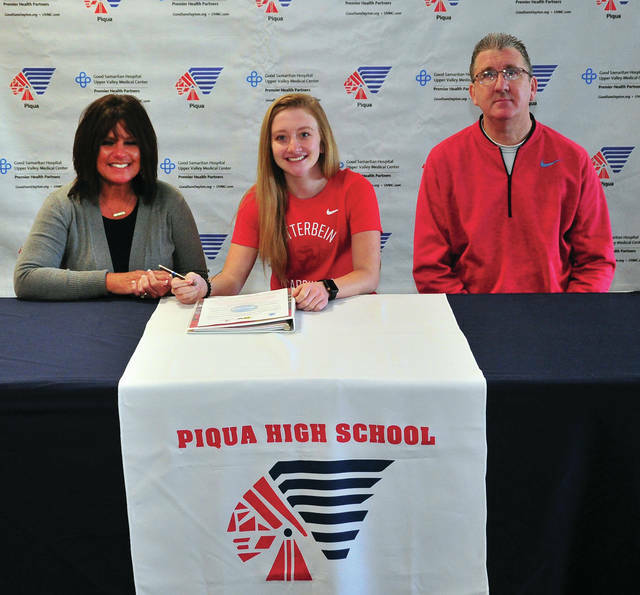 And the daughter of Kirk and Anita Bachman made it official it will continue for another four years when she signed her letter of intent to play for Otterbein University recently in front of friends, teammates and family in the PHS commons. Bachman has made steady progress during her high school career. After a 55.0 stroke average for nine holes (in the GWOC) as a freshman and earning special mention All-GWOC North honors, she has earned first team All-GWOC North honors the last three seasons after much hard work. Her stroke average went down to 48.47 as a sophomore and it stayed steady her junior year. Bachman had a 49.29 stroke average and become the first Piqua girls golfer to ever qualify for the district tournament. As a senior this past season, she lowered her stroke average by almost five strokes down to 44.94 for nine holes. Piqua girls golf coach during Bachman’s career was Cathy Barhorst and she sees a bright future for Bachman. And Bachman knew after spending time at Otterbein, it is where she wanted to do it. The biggest attraction was coach Brian Booher. Booher has been a PGA Professional for 18 seasons. He has twice been named the Ohio Athletic Conference Coach of the Year in women’s golf. He guided the Cardinals to the OAC championship and an NCAA bid in 2015, while Otterbein finished second in the conference in 2014, 2016 and 2017. Bachman knows she will be exactly where she wanted to be. But, Bachman has made up for lost time quickly —- giving her the opportunity to continue to grow in the game she loves at the college level. https://www.dailycall.com/wp-content/uploads/sites/30/2019/03/web1_031919mju_golf_phs_bachmansign.jpgMike Ullery|Call Photo Piqua High School senior Kelsey Bachman signed her letter of intent to play golf for Otterbein University recently. Shown with Bachman are her parent Anita (left) and Kirk (right) Bachman.